A souvenir at the top of your list when visiting Morocco is most likely an is an authentic Moroccan tajine. That is until you discover how many different options exist for purchase. It can quickly become overwhelming and frustrating. We recommend that you do a little bit of research ahead of time so the experience will be much smoother. When you first begin to look have an idea in mind of the size tajine you would like. Typically, they are categorized by the number of people they will serve. A small tajine in Morocco is used to serve 1-2 people, a medium for 3-4 and a large for 6+ people. 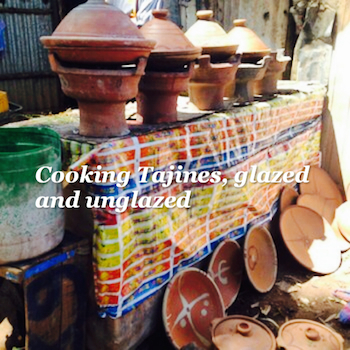 There are two types of cooking tajines; glazed and unglazed. You will be able to tell a tajine is for cooking in because it will not be painted. It may have decorative etching into the clay but that is the only decoration. A glazed tajine has a shiny appearance and unglazed looks like natural clay material. Different cooks like different types of finishes. Either type may or may not have a small hole at the top of the cone. You shouldn’t worry if you see it – or if you don’t, it’s just a different style. A glazed tajine is good for the cook who might worry about burning food inside. They clean easier and are more forgiving. Unglazed tajines take a little longer to “break in” and food burns quicker if it gets too hot. Many professional cooks swear by unglazed clay. They also develop a flavor with time. The other type of tajine you will see in the Moroccan souks are highly decorated with paint. These tajines are not made to or meant to be cooked in. Food is cooked separately and then transferred to the decorative tajine. You should always ask when you’re looking at a tajine if it can or cannot be cooked in just to make sure. Once you’ve chosen your tajine and taken it home it’s time to get it ready. Unglazed tajines need the most preparation. They should be first rubbed with olive oil and then submerged in water for at least 24 hours. Let the tajine dry completely (another 24 hours) before using. Gazed tajines can also be pre-soaked but it’s not always necessary – ask the vendor when purchasing what they would recommend as it can vary. To cook with a tajine always use low heat on a stovetop. You can cook on an electric or gas stove top or oven. If you’re using an electric oven you will need to put a diffuser between the tajine and the coils. They can be purchased online and from many shops in Morocco inexpensively. Be sure to check the water levels in your tajine so that it doesn’t get too low. A dry tajine will crack if there isn’t liquid and it gets too hot. You should never wash your tajine (especially unglazed) with soap. The clay of the tajine is very porous and the soap will soak into the clay and can leave a funny taste. Instead soak in hot water, and use a coarse scrub brush or steel wool to remove any food stuck to the surface. There is a learning curve to using a tajine so don’t get discouraged if the first few times it doesn’t work out, but once you’ve mastered it you’ll be ready to make another trip to Morocco for more tajines to stock your kitchen! Amanda Mouttaki is a food and travel writer and blogger, with an expertise on Moroccan culinary traditions and food culture. Her passion is uncovering the stories behind traditional cultures and food around the world. She lives in Marrakech, Morocco with her family. Explore Morocco on tailor-made Private Tour. With the ability to fully customize, a Morocco Tour, a tailor-made experience delivers an authentic, private travel opportunity for couples, families and the indepdentent traveler. A tailor-made Private Tour also offers the flexibility to engage with locals, discover exotic foods, visit hertiage UNESCO Heritage sites, camp in the Moroccan Sahara Desert and stay at charming boutique riads and hotels. Fes is the fourth largest city in Morocco and also known as one of the ancient imperial cities. It is separated into three parts, Fès el Bali (the old, walled city), Fès -Jdid (new Fes, home of the Mellah), and the Ville Nouvelle (the French-created, newest section of Fes. The Medina of Fes el Bali is believed to be the largest contiguous car-free urban area in the world. 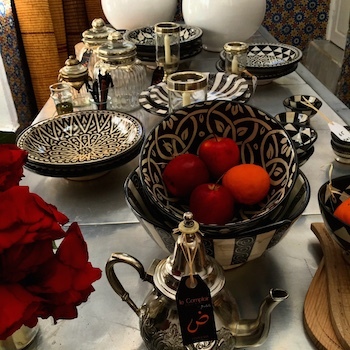 Cooking Classes are conducted by a dada (traditional Moroccan cook) or a chef from and held at a kitchen in the medina or in a palmeraie garden setting. Classes are a total of 4 hours with an option of an add on of wines tasting accompaniment. At a typical half-day cooking class, travelers can learn to prepare an appetizer and a main dish, or a main dish and desert. 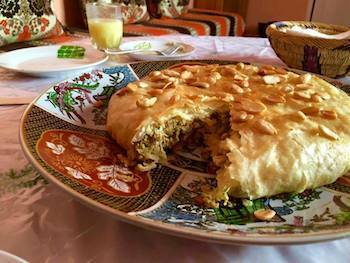 A Food Tour is a special opportunity to go deep in the heart of the a Moroccan medina and discover local delicacies. Food Tours are offered in both Fes and Marrakech, led by locals and serve as a replacement for lunch or dinner. Camping in the Sahara Desert and taking a Moroccan Camel trek is the perfect to travel the south. Nomadic villages can be explored along with Kasbahs that are situated in palm groves, surrounding valleys, mountainous landscapes, gorges and sandy Saharan dunes. Casablanca is one of the most famous cities visited by first time travelers to Morocco and well known for the Hassan II Mosque. Lesser known are its’ Art Deco Architecture and Sites. Casablanca has long history of engaging architects who once built Anfa’s grandest buildings that have typical Deco features of wrought ironwork, vasilating arches and colored, stained glass in geomteric shapes. Visiting the Art Deco Historic sites of Casablanca is a rewarding and way to discoer the past. Meet a local Berber family, partake in a cooking lesson of how to make traditional bread. Berber bread is baked in clay ovens or on volcanic rock and stuffed with a variety of local spices made from fresh, dried and smoked ingredients. Traveling by luxury, 4×4 Land Cruiser across Morocco will enable you to cover a vast amount terrain in the most enjoyable and relaxing way. This way of traveling is highly recommended to first time travelers to Morocco and also to those who want an intimate, personal experience that is seamless from beginning to end. Riads are restored palace style accommodations with courtyards, lush gardens, and traditional zellij tile work. 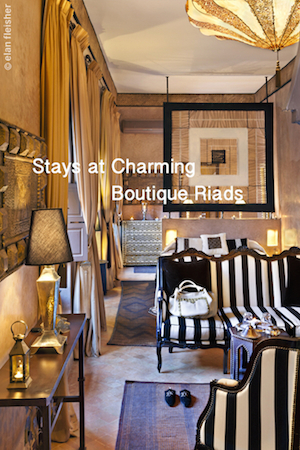 Morocco is known for having the best, luxury riads that offer an Arabian Nights sensibility. The Best Riads can be found in Morocco’s old medinas. Riads offer a combination of traditional and modern decor with excellent service, luxury traveler amenities and local Moroccan cuisine. Volubilis also referred to by Moroccans as Walili (Arabic) was the administrative center of the province in Roman Africa called Mauretania Tingitana. The Mauritanian capital, founded in the 3rd century B.C., became an important outpost of the Roman Empire and was graced with many fine buildings. It was destroyed by an earthquake in the late fourth century AD and later reoccupied in the sixth century, under the Abbasids. Extensive remains survived and create now what is considered one of the most important archaeological sites in Morocco. A tailor-made private tour includes luxury transportation in a 4×4, Viano or Minibus, accommodations at Boutique Riads and Hotels, a Multilingual Speaking Driver that is fluent in English, Arabic, French and Berber along with Licensed, expert Historical Guides. Whether you prefer Old cities, Roman ruins and the souks or the Sahara Desert, the High Atlas Mountains and natural wonders, a tailor-made tour will be customied to your personal interests. 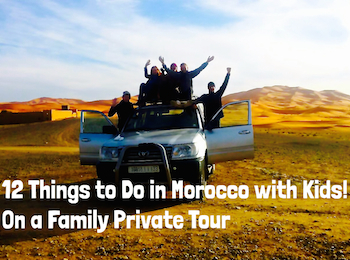 Morocco is a family friendly country and the perfect choice for travelers with kids. Whether you are planning Morocco vacation as a younger family or traveling with older children Morocco has a wealth of adventure activities and things to do with kids. There are many exciting activities that serve as family tour essentials on a private tour not to be missed. Moroccans love children and much of the culture revolves around family. Children are welcome in Morocco and treated well and with much personal interest. It is common for Moroccans to admire children, offer compliments and engage warmly with families. The unique combination of Morocco’s rural landscapes paried with the old world medinas (cities) and mix of exotic cuisine make Morocco a magical place to take a Family Adventure vacation. Camel Trekking offers a unique way to travel Morocco’s great south. Families can explore nomadic villages and Kasbahs situated in palm groves, surrounding valleys, mountainous landscapes, gorges and the grand Sahara Desert Dunes. Camel trekking is an inspirational family adventure that shows how Moroccans traveled through the desert for decades and centuries before. Trek to an Oasis or camel trek at sunset before overnighting in a desert camp in the heart of the dunes. 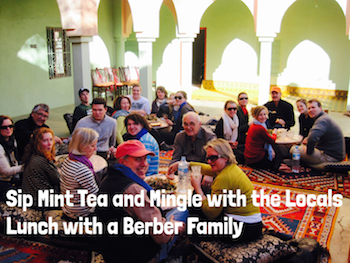 Food Tours serve as an opportunity for families to discover local Moroccan cuisine. 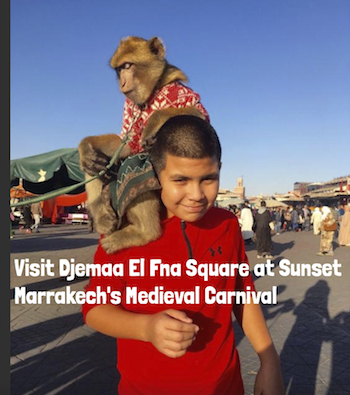 Venture on a guided, private Food Tour of Marrakech’s Djemma El Fna Square. Discover the best local eats such as exotic snail soup, sheepshead and sip Mint tea. A Fes Food Tour hosted by a local is also a perfect family activity for kids. Your local Moroccan Food Tour guide will share traditional cooking methods by taking you to visit a furnatchi where the water for the communal bath house ‘hammam’ is also heated, and a 400 year old ‘furan’ or communal oven and bakery. Look no further as the world of spices and their uses and the secrets will be in your hands. Explore the spice market and the male-oriented domain of the tea den under the guidance of a culinary leader and story-teller. Learn to bake bread in the 400-year old community oven with the baker overseeing your hands-on efforts. Take your hot bread to the honey souk to try it with 8 artisanal wild honeys, aged butter or khlia, spicy dried beef. Food tours are created for foodies and those who have the penchant for the exotic, you may try cooking ‘on-street’. Shop and fill up a terracotta urn ‘tanjia’ to have embedded in the hot ashes of the furnachi for a rich and spicy Moroccan casserole, followed by a succulent tasting. Hiking in Morocco is an essential family activity. With the High Atlas Mountains and located just an hour from Marrakech, families can trek through Berber Villages, overnight at a refuge and dine at a local family, Berber barbecue. Djemaa El Fna Square is said to be the heart and soul of Marrakech. At the signal of sunset, this mysterious and mesmerizing place truly comes alive. Snake charmers fiddle flirtatiously with their cobras, fire swallowers eat fire, storytellers entertain big crowds, fortune tellers mesmerize tourists with tall tales and the rhythms of African and Arabic sounds hypnotize the crowds amongst the colorful clouds of cooking smoke decorating the air with mingled aromas of mint, cilantro, cumin, and turmeric. The square is transformed into a magical medieval styled circus. Experience a traditional Fantasia at the Chez Ali Equestiran Show in Marrakech. A Fantasia is an equestiran horse show, with entertainment, with Berber song, dance and fireworks that can be enjoed with a Moroccan meal of miswhi (Moroccan roasted lamb) and couscous. Morocco’s medinas )ancient cities) have narrow alleys, each leading to hidden architectural jewels and unique Moroccan historical sites. Morocco’s medinas are traditional living quarters of the local population that has within them neighborhoods which allow self sufficiency such as a mosuqe, water fountain, bread oven, vegetable souk and butcher. Medinas also have magnficient boutique riads and hotels, opulent gardens, restaurants and are home to wonderful fruit and vegetable souks, handy crafts, woodworkers, desginers and bakers. Quad riding in Morocco is ideal for families looking for adventure or those who want to experience rural terrain. Morocco offers dense desert trails, wild beaches and dunes that you can fly across during your Quad biking session. Quad bike across the Sahara Desert in Merzouga’s Erg Chebbi Dunes, M’hamid El Ghizlane’s Dunes or Erg Chegaga’s Dunes. Cooking Classes are conducted by a dada (traditional Moroccan cook) or a chef from and held at a kitchen in the medina, rural or in a palmeraie garden setting. Family Moroccan Cooking Classes are a total of 4 hours with an option of an add on of wines tasting accompaniment. At the end of each class, families can dine on the meal they have prepared. At a typical half-day cooking class, families will prepare an appetizer and a main dish, or a main dish and dessert. Hot Air Balloon Over the Atlas at sunrise with views of Marrakech. Enjoy a 1-Hour balloon flight, then receive your souvenier flight certificate. Included in the kid friendly adventure for families is a 4×4 Land rover excursion through local Berber villages to a private tent where breakfast is served along with a visit to a Berber house and camel trek across the Marrakech palmeraie. 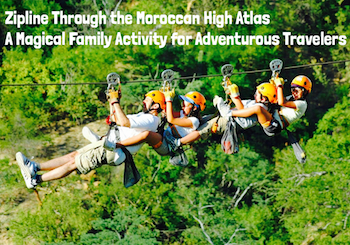 Zip Lining across the High Atlas can easily be incorporated as a one or two day excursion from Marrakech. The estate Travel Exploration works with is a grand example of ecotourism in Morocco done at its best suitable for families with kids. Take in the breathtaking famous 700-foot gorge and tree-to-tree zip-lining. Morocco adventure travelers can also cross the Tyrol suspension and tight-rope bridges, hike and trek on foot, horse or mule, participate in Berber bowling, archery, falconry and polo on mule-back. To top this off there are Berber weaving demonstrations along with Moroccan cuisine and tea-making workshops. Oasaria Water Park serves as the perfect day excursion for families planning to visit Morocco in summer. This water park features multiple slides, a wave pool, a lazy river & kids’ splash areas. Meet a local Berber family, sip tea in the Sagro Mountains, and dine on couscous. Then explore and tour the village by foot. Walk in the green fields and see how the traditional Berbers live with their gardens of herbs, livestock, and henna plants. After lunch, you can have your hands and feet painted with henna or your hair adorned with saffron by a local village artist and relax. Experience the tradition of Berber perfume made from musk and amber along with the villages own spices. Essaouira is the perfect excuse to head southwest of Marrakech to experience a one-of-a-kind coastal town in Morocco. Laid back with a hippy vibe, windswept Essaouira, also referred to as “old Mogador,” attracts the Bohemian types searching for an inspiring destination where a keen combination of savory cuisine, local markets, artisans and seaside walks can be found. For the last century, Essaouira has attracted artists, writers, architects, and surfers, those with wanderlust along with retirees who came for a stop over and decided to make it their home. This charmed Moroccan town is the ideal travel destination for independent travelers interested in discovering the insiders guide to coastal living or those who desire a private Morocco Tour. As a UNESCO World Heritage site, Essaouira’s medina is surrounded majestic stonewalls. Its tranquility, sandscapes and diverse population have made it a trendy summer getaway. In the ’60s and ’70s, Essaouira was a pit stop on the hippie trek from Marrakesh. Jimi Hendrix made the pilgrimage, as did Bob Marley and Cat Stevens. Essaouira was the inspiration for Hendrix’s song “Castles Made of Sand.” Home to some of Morocco’s best chefs, Essaouira’s unique combination of tasty local fare, fresh produce, and delightful markets created a Moroccan hub where foodies congregate. Whether you are visiting Essaouira on a one-day trip from Marrakech or as part of a Private Tailor-Made Morocco Tour this ancient city and it’s white washed walls with painted cobalt blue shutters offers a wealth of history, old world architecture and culture that is not to be missed. The medina of Essaouira is a UNESCO World Heritage listed city, an example of a late-18th century fortified town. Essaouira’s history is a reminder of the times when Spain, Portugal and England fought to maintain control over its coasts. It has a typical Portuguese harbor that is a stunning example of Moorish and Portuguese architecture. 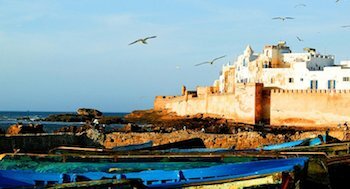 Essaouira, originating from the Phoenician word Migdol meaning a “small fortress” was the first port in Morocco and once linked the country to the rest of the world. Since its foundation Essaouira has been known for its diverse ethnic groups of Amazighs, Arabs, Africans, and Europeans with a mix of Muslims, Christians and Jews. The medina of Essaouira and its ramparts are the essential place to begin your exploration and as time allows an excursion to a local winery or a fromagerie is also highly recommended. Visit Place Moulay Hassan Take a stroll along the town’s sunlit pedestrian main square, Place Prince Moulay el Hassan and the Skala du Port, the fishing harbor, offers breathtaking views of the Portuguese ramparts. Explore the Portuguese ramparts and the spice souk, dozens of boutiques selling silver jewelry and the medina’s clock tower. Visit Orson Welles’ Square and memorial, designed by Samir Mustapha, one of the towns artists, which pays homage to Orson Welles filming of Othello in Essouaria. Thuya Workshops Indigenous to Essaouira is the Moroccan thuya tree. Only in this coastal town can travelers visit Skala de la Ville, also known as the woodworker’s souks. Intricately designed thuya wood items can be found hand laid and inset ebony, walnut and citrus wood. There is a prior tradition of artists harvesting their own wood. Today this ancient tradition has been abandoned. Many artist cooperatives offer the option to design and command on order tables and other objects with thuya. Don’t miss out on seeing how these small treasures are made. This local historical and craft museum contains a wide variety of carpets, textiles, clothing, jewelry, metalwork, woodwork and historic photos. It is one of the few museums in Essaouira and definitely worth a visit. French Institute Part of a network of 12 institutes under the umbrella of the French Institutes in Morocco. While the French institutes aims to promote French language and culture it also offers concerts, cultural events, debates and exhibitions along with other cultural events. All are free of charge. 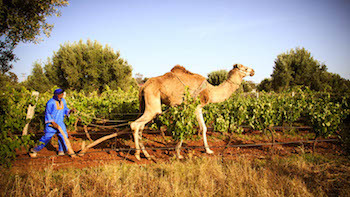 In 1994 Charles Melia created this boutique winery using organic farming methods, just a few kilometers from Essaouira. The Val d’Argan wine tasting is a perfect afternoon excursion from Essaouira and consists of a combination of many elegant offerings. The wine tasting can include a peppering of reds, rose, whites and Moroccan Gris, all consumed with local cheeses or the option of Moroccan lunch. As the result of Val d’Argan, Southern Morocco offers a new vintage each year that make up the wide range created from The Gazelle of Mogador, El Mogador, the Val d’Argan and Orients of the Val d’Argan. Many of the wines made at Val d’Argan can be purchased and are also offered at local restaurants in Morocco. Book in advance! 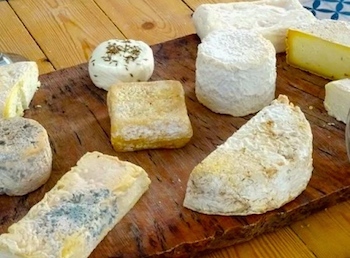 Located on Route Cotiere de Safi, just 8 kilometers from Essaouira is Abderrazzak Khoubbane’s La Fromagerie. It is one of two fromageries in Morocco, the other being in the rural region of Fes. True to its name Abderrazzak runs a and farm to table restaurant with some of the best “cheese, cheese and more cheese.” The menu is prefixed unless you request a la carte. It consists of local organic wine, home made lightly fried cheese for an appetizer with sides of minty fruit jellies, then a hardy vegetable fresh cheese salad along with a main of Moroccan grilled / smoked meat and upon request a vegetarian, cheese tajine. For desert, a wooden plank is served up with various types of goat, cow and camel cheese. More then a meal, this is an experience. For a side-excursion within Essaouira consider a visit at Ranch de Diabat, located in the small village Diabat. Ranch de Diabat arranges tours of high quality with camels or horses – and it can be for 2 hours or it can be for several days. If your preference is to stay in Essaouira proper consider Equivasion. Go local. Take a Cooking Class with Khadija’s Kuzina. Explore authentic Moroccan at a private, home cooking class in Essaouira. 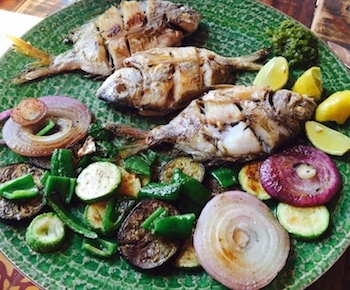 Learn how to make the most delicious meal you will have in Morocco. You will be met by your local chef and experience an overview of Moroccan cuisine. Enjoy a medina walk to discover the spice market, the fish monger and the various kinds of local fresh produce available. Enjoy a demonstration of how Moroccan bread is made. Moroccan Meal Description: Prepare two Moroccan cooked salads, chicken and lemon tajine with preserved lemons and olives or pastilla, and fruit salad or pastilla with milk for desert. Participate in a Moroccan tea ceremony. Dine on the mouth-watering lunch that you prepared. Essaouira’s population is approximately 70,000 with fewer then 25 Jews. Visit the Essaouira Jewish Synagogue & Mellah: Jacky Kadoch is the president of Essaouira’s Jewish community. Rabbi Chaim Pinto, the synagogue of the revered Pinto is located in Essaouira’s medina within the Jewish Mellah. The building is an active synagogue, used when pilgrims or Jewish tour groups visit the city. The synagogue is on the second floor of a three-story, courtyard building inside the walls of the old city that also contained Rabbi Pinto’s home and office. Essaouira’s mellah covers over 10 percent of the town, but Jews constituted almost 40 percent of the population in the late 1880’s. Jewish stars on the doors to the mellah show the degree to which Jews were accepted in Essaouira, to the point that some of the richer Jews did not even live in the mellah. Commemorative plaques indicate the buildings in which synagogues were located. Former inhabitants of Essaouira, most of them Jewish, formed a committee to rehabilitate the town. An important member of the committee is King Hassan II’s Economic Advisor, Andre Azoulay. The Jewish cemetery, just outside the city gates, is extremely well kept. The hiloula of Chaim Pinto is held in September.” Rabbi Chaim Pinto is buried there. A great place for a pre or post dinner drink and to dine with views near to the sea. It caters to an International audience and has a full bar. Taros offer simple yet very tasteful dishes in a nice ambiance. The library of books on art, the small boutique and quality of music make having a meal here one of the perfect experiences for Essaouira. L’Heure Bleue Palais is built into the medina walls. This luxury boutique hotels is an oasis of calm and their piano bar with wrap around courtyard or rooftop terrace are ideal for sunset cocktails. The perfect place for sunset cocktails this boutique restaurant and bar is laid back and oh so chic. The décor offers up a friendly reminder of being in Montauk. The Vagabond has a full view of the Atlantic along with horseback riders, camel trekkers and surfers who frequent the area. There is a sister property in Dakhla for those interested in heading down south. An Essaouira landmark this restaurant is on the seafront overlooking the beach. Ask for the daily fresh catch or their speciality of oysters, sea urnchins, prawns, squid or lobster. Add this to the list for sunset coctails with unobstructed ocean views. The Former owner of Villa Del’O, Caroline and her Scottish partner have teamed up and created one of Essaouira chicest restaurants with contemporary chic decor and cuisine that well deserves a gold star for this excellent Moroccan table. One Up is a beautiful loft space and also the former British Consultate. The menu is selective offering a combination of French bistro’s best from foie gras to salmon burger. Alike the decor the food is a work of art, made by a French chef with a wonderful twist. Exotic virgin cocktails are complimentary and the services is top notch. This is a relatively new restaurant and on the road to be one of Essaouira’s best. One Up to this new venture. Inspired by the cuisine of the south, Serge Peuzin launches a new challenge with his O’Bleu Mogador. Master Chef since 1997, this chief Marseillais, has always been at the head of institutions of high quality. The culinary influences of Serge Peuzin come from Italy, Spain, Lebanon, and Morocco. An address that he wants cozy and friendly, with a leader who opens in front of you in an open kitchen, a feast for the eyes and the taste buds. Bernadette, the wife of Serge, is part of the adventure and it is she who provides the reception of clients, manages the reservations and reign on the service in room. O’Blue Mogador’s, fusion cuisine is surprising and unprecedented – full of flavors and surprises, which often changes and over the seasons, products from the market, of the fishing and the terroir. “Small tajines, casseroles, casseroles and delicacies” are on the list. Located in Sidi Kaouki, with stunning views of the Atlantic, this boutique restaurant by the sea offers up a corner of paradise in coastal Essaouira. 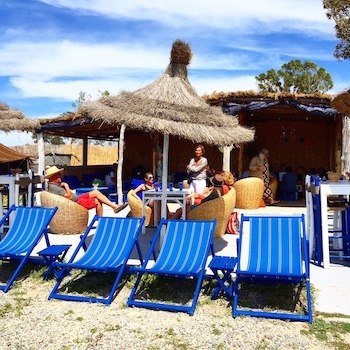 La Mouette et les Dromadarires (The Seagull and Camels), offers a wide array of seafood options and is the perfect lunch spot on a sunny or wind swept day. Just 30 minutes from Essaouira you can dine on plates of seafood carpaccio, tartar, smoked, crunchy, crispy, or simply grilled seafood on the plancha. For those who prefer the meat, try the grilled lamb chops or salad voile along with a gastronomic terrine. Oysters from Dakhla and fresh lobster are available upon request. The décor features chic Moroccan lounges perfectly situated under a Berber tent and comfortable sofas along with tables and sunbeds. All food is organic. Reservations required in advance. Don’t miss this one! Known by locals as the best place to eat Msimen, a flaky pancake and Harira Soup, Chez Miloud is a must dine while in this coastal town. Owned and run by locals. Called “Driss” for short by locals, this landmark, well appointed café is near to the entrance of Hassan Square. 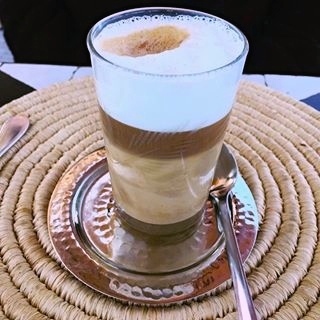 Ideal for breakfast or an afternoon coffee they offer a wide array of delightful Moroccan and French pastries, the typical Moroccan “nous-nous” (half coffee, half milk) and breakfast breads. The atmosphere is full of native and local Essaouira artwork. Run by the owners of Villa Maroc, this calm and chic café offers hearty breakfasts, light snacks and delicious salads. Their specialty is homemade, fresh ginger lemonade. Located on the corner of place de l’horlodge. This tea lounge is located inside a five-story converted riad that overlooks sea along the Skala wall. It’s laid back décor if teal blue accentuates the ocean and makes watching the seagulls that fly across in an eyes view picturesque. They offer wonderful deserts and coffees for those with a sweet tooth. With magnificent views of the sea from their second floor and terrace, there’s no need to go elsewhere. Essaouira is one of the best shopping destinations in Morocco for those looking to sample traditional goods at reasonable prices in a laid back atmosphere. Essaouira’s leading concept store that has a unique blend of jewelry, clothing, decorative objects, and home design pieces with an east meets west trendy designs sensibility. The boutique also showcases hip brands such as Sissi Morocco, Moroccan Touch, Bakchic along with up and coming designers. The owners of Historie de Filles have a new space located just beside dedicated to the gastronomy of the kitchen. The items for sale range from utensils with the dishes of among Chabi chic, inspired by the traditional hand-painted terracotta of Safi. of boucharouite carpets is quite extensive. And you can feel good about your shopping as 10% of the proceeds support Project 91, a UK-based charity that supports at-risk youth in Essaouira to improve their job and education prospects. Some of the best designed Rafia shoes and sandals woven with the doum palm can be found at this small, chic boutique located near Bab Marrakech in Essaouira. Rumor has it that the Italian designer, Salvatore Ferragamo teamed up with the owner long ago and uses this address and its rafia as inspiration and creation for some of his top end designs. Prices are higher then other local shops in town however the quality and comfort of Rafia Craft’s footware cannot be surpasses. An upstairs boutique across from the beach in Essaouira that has the feeling of an Oriental bizarre with a design showroom. There is a fine mix of vintage, chic and nomadic objects for sale. Sober and elegant this is a creation Madada Mogador’s owner, Christine and her brother Pacha. There we learn the secrets of Moroccan specialties as the couscous, tagines the pastilla without forgetting the Moroccan pastries of course! Joseph Sebag, many refer to as one of the last remaining Jews of Essaouira owns a charming bric-a-brac store located under the ramparts. It is filled with a melange items such as antique, silver Berber and Jewish jewelry, exotic dagers, other Souri finds along with English and French books. Sebag is worth meeting as he carries a wealth of Essaouira’s Jewish History with him. that houses the showroom and the wonderful boucherouite carpets that adorn the floor. The shop is closed from lunch daily from 12:30 to 2:30 p.m.
Essaouira’s Sunday flea market filled with second-hand items, antique treasures and junk stalls. With views of the Coast this market where a rare gem can be found also has Native Swiri Artists that feature there naïve creations of art in self-decorated houses and small buildings. One of the must-do experiences in coastal Essaouira is to spend a lazy afternoon at leisure in a traditional Moroccan Hammam. The Moroccan hammam begins with a traditional ritual of glazing the body with – ghassoul, a natural clay extracted from the Atlas Mountains, then black soap is applied on the body, made with local olive oil, prior to a body scrub with the final phase of rose or orange water sprayed lightly, made from the Atlas roses and used to calm the skin. Don’t miss out on a Hammam experience at one of these Essaouira Luxury Spas. A spa in seaside Essaouira offering massages, hammam and beauty with argan products and local flower essences. Moroccan owned. A new luxury spa in Essaouira that offers massages, hammam treatments and beauty days with argan products and local flower essences. Alizes Classical Music Festival Every year in April, the Moroccan port city of Essaouira holds one of its many annual festivals. The Spring Festival is called the “Printemps Musical des Alizés” (the Musical Springtime of the Trade Winds). As well as featuring international and Moroccan artists of classical music genres, the festival celebrates the coming of spring. The festival in Essaouira also coincides with the spring season of local religious festivals and pilgrimages of both the Muslim and Jewish faiths. In the local Moroccan Arabic dialect, such festivities are called moussem. Gnaoua Festival The mysterious music of the Gnaouas celebrated each year in June at the Gnaoua Festival in Essaouira. 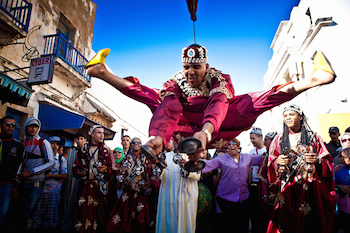 The Gnaoua Festival attracts a cosmopolitan audience of festival-goers and offers a rich program, reaffirming its goal to emphasize the Gnaoua heritage in all its variety and to invite the best world and jazz artists to come and perform in the unique and magical town of Essaouira. This popular four-day festival features art exhibitions and Gnaoua style music. International musicians and groups from Tangier Marrakesh, and Essaouira perform their Gnaoua sounds at the Place Moulay Hassan and other spaces in the medina and outside its city walls such as Bab Doukkala, Bab Marrakech, Dar Souiri, Chez Kebin, Zaouia Gnaoua, Place Khayma and the Marche Aux Grain. The Festival des Andalousies Atlantiques (Atlantic Andalucía Festival) This festival celebrates the shared Arabo-Andalusian heritage of Morocco and Spain. The intention of the festival is to encourage peaceful co existence and takes place each Septemberr or October in Essaouira. 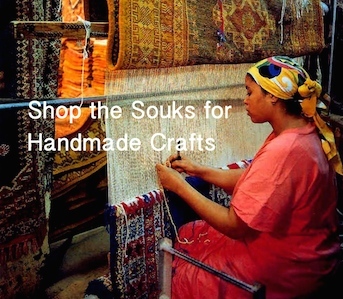 For more information about Things to Do in Essaouira. You are currently browsing the Travel-Exploration Blog blog archives for July, 2016.